CES 2015: Braven unveils new wireless speakers | What Hi-Fi? 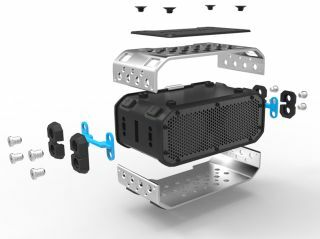 Braven has been busy at CES 2015 in Las Vegas this week, with the American wireless audio brand announcing the launch of a number of new portable Bluetooth speakers – including the BRV-PRO. The BRV-PRO is the first "ultra-rugged" PRO series speaker from the manufacturer and is targeted at "outdoor enthusiasts", with its IPX7 waterproof design shielded by an aircraft-grade aluminium shell. It's capable of up to 20 hours of playback thanks to the 2200mAh rechargeable battery, which is also able to act as a power bank and charge USB devices. A solar charging panel can be fitted too. The speaker – available for $150 (UK pricing to be confirmed) – can withstand dust, water and more. Meanwhile, accessories starting from $30 also include a Stack Plate Multiplier to link other speakers. Elsewhere, Braven has expanded its Design Series with the addition of the 1100, 2200b and 2300b "luxury" Bluetooth speakers – available in six colours and with price tags starting from $250. The 1100 supports the aptX Bluetooth codec and is due to go on sale in the second quarter. It comes with TrueWireless technology, letting you pair another Braven 800-series, 1100 or BRV-HD speaker. In comparison, the 2200b ($300) and 2300b ($350) boast left- and right-channel stereo and over-the-air updates to ensure you keep up to date with the latest software tweaks from the manufacturer. Braven's new 805 Bluetooth speaker (above) comes in nine colours and has been designed to act as the "ideal home companion". It will cost £200 and is equipped with TrueWireless Technology. The Balance ($150) is described as the "ideal active-lifestyle" speaker, with an anti-slip exterior that makes it easy to carry when wet. Its 4400mAh battery can also charge your mobile device. And last but not least is the Braven Fuse ($100), a Bluetooth mixer that can link to two audio sources and two speakers in order to let you create custom tracks and splice songs between devices.